It seems these days we’re constantly searching for ways to live a well-balanced life. From eating a balanced diet, to finding a healthy work-life balance, to getting the right balance of sleep, good nutrition and exercise, “balance” is today’s hot-trend (that will hopefully have lasting power). And then of course, there’s the biology of it. The billions of cells in our bodies that must maintain a healthy pH balance in order for our bodies to function at an optimal level. Literally “pH” stands for “Power of Hydrogen”, which is a measurement of the body’s hydrogen concentration. When we talk about balance we are referring to the alkalinity/acidity in our blood. This is measured on a scale of zero to fourteen. 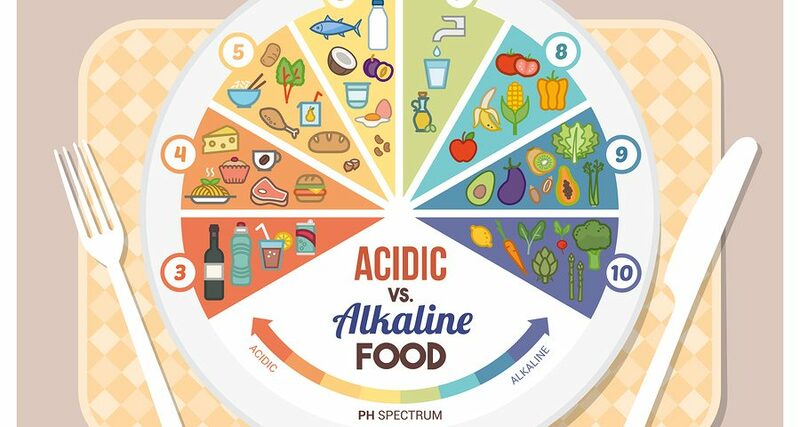 The more acidic a solution is the lower the pH is, the more alkalinity, the higher it is. A healthy pH balance is a solution with a pH of seven or slightly higher. How does pH affect health? Overly acidic bodies are a feeding ground for unwanted organisms like bacteria, yeast, and fungus. This condition is called acidosis. Overly alkalotic bodies are susceptible to respiratory and/or metabolic disorders. This condition is called alkalosis. When your pH levels are balanced there is a much smaller chance of illness. An unbalanced environment is the feeding ground for disease and disorder to take root. If your pH is out of balance in either direction (too high, or too low) it needs to be treated by your doctor to prevent dangerous consequences. It’s actually quite simple to test. You can even purchase a pack of pH test strips at your local pharmacy! Your kit will include test strips and a chart for you to compare your results with. You can test your pH with saliva or urine, the ideal sample being the second urination of the morning. NOTE: talk to your doctor about the best way for you to accurately have your pH levels tested. Though numerous factors can affect pH levels, the biggest contributor is diet and lifestyle. Like many medical conditions taking preventative measures is always the best practice. Exercise regularly; eat a healthy diet that includes lots of raw vegetables and fruits, limit your alcohol and caffeine intake and don’t smoke. Obesity is another common factor to consider, so try to avoid eating processed and sugary foods. What if your pH levels are not balanced? If you find that your pH levels are out of balance make an appointment with your doctor to talk about what treatment is best for you. Depending on what you pH levels are and taking into account the rest of your medical history, your doctor will be able to help you find the ideal treatment to get your body back on track.